The Branchline coupler is a signal divider that can separate an incoming signal into two equal power, but 90 degree phase shifted signals. It consists of 4 ports: Input (P1), Output 1 (P2) and Output 2 (P3). The fourth port (P4) is terminated at 50 ohms for the signal splitter and is isolated from the input. The branchline coupler consists of four transmission lines, each a quarter-wavelength long at the target frequency. 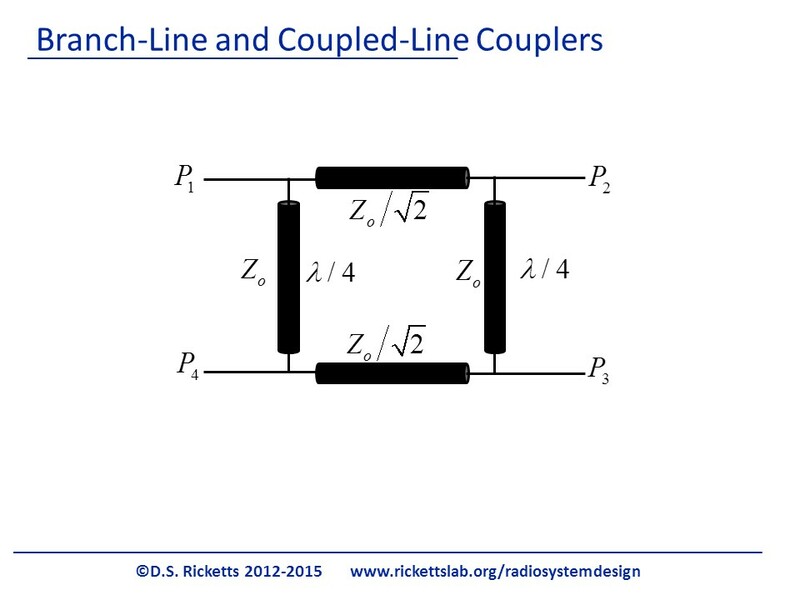 Two have the characteristic impedance of the terminations (Ports P1-P4) and two have one that is reduced by 1/√2 or is 35.35 Ohms. It should be obvious that the impedance of the transmission lines do not match with the port, i.e. 50 Ohm || 35.35 Ohm is not 50 Ohm. 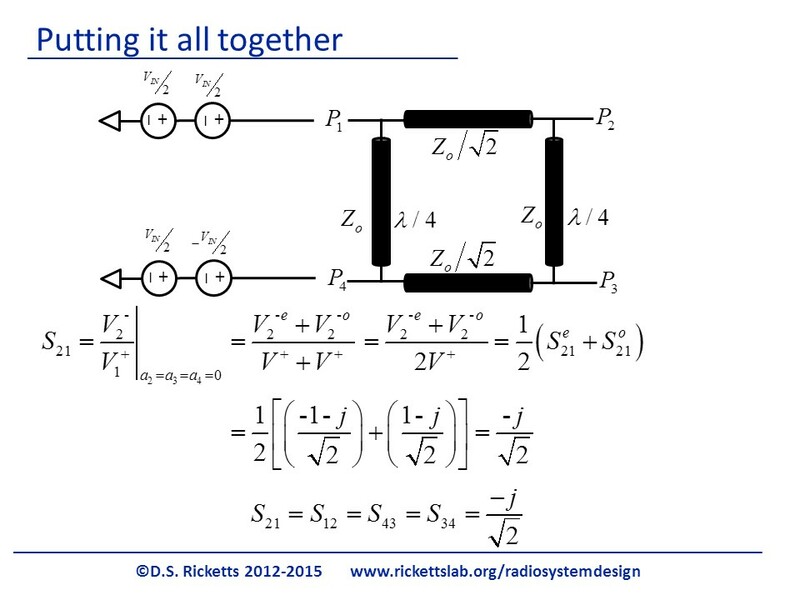 This tells us that the operation is a little more complicated than just a phase shift through a few transmission lines. 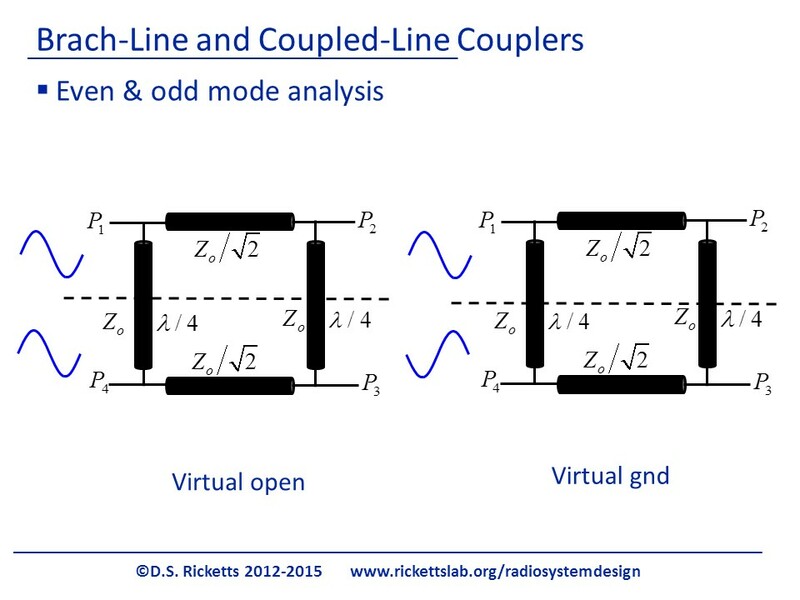 We will use even-odd mode analysis to determine the operation of the branchline coupler. 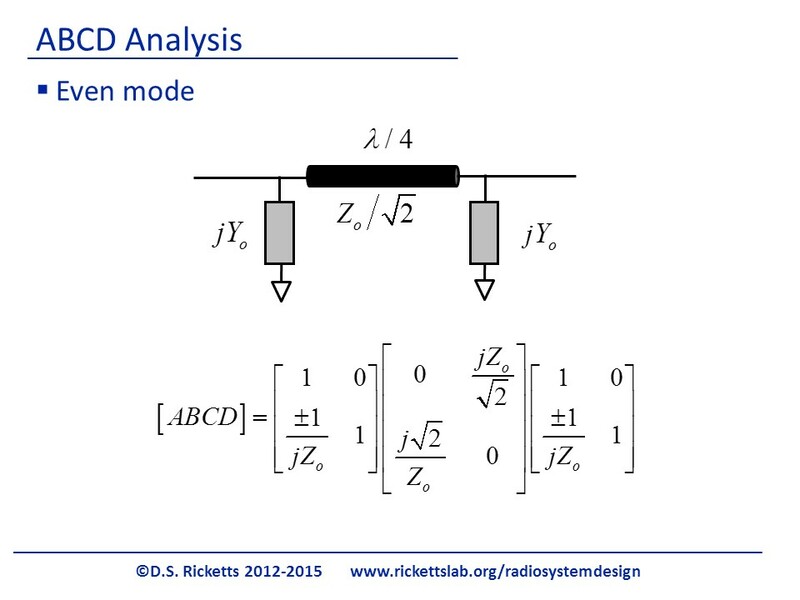 Every signal can be split into an even and odd mode, or a common mode and differential mode. Drawn here are the two modes: even (left) and odd (right). 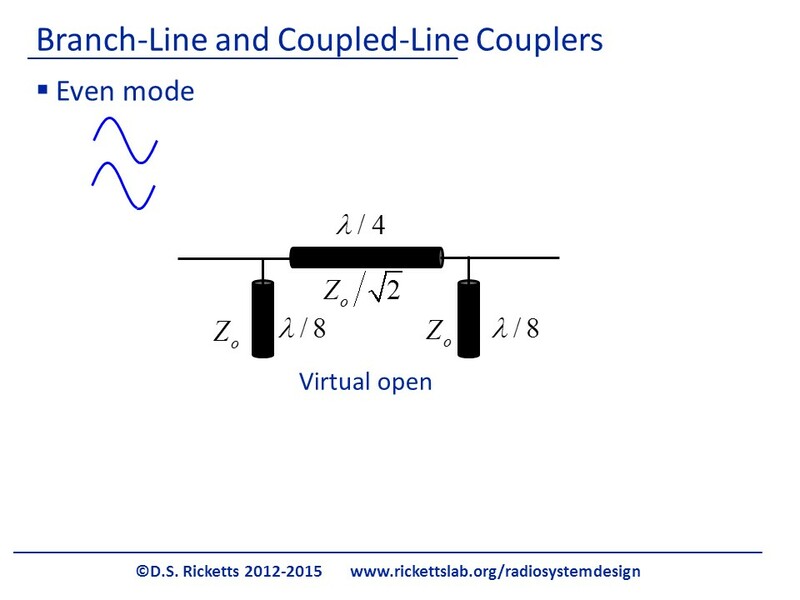 We will use the fact that in the even mode, the dashed line is an open – no current flows through the transmission lines as the signals are in phase. For the odd mode the dashed line is a virtual ground, or short. We will examine the even mode first. We have split the coupler into two parts, just looking at the top half (they are symmetrical). We treat the dashed-line plane as a virtual open. 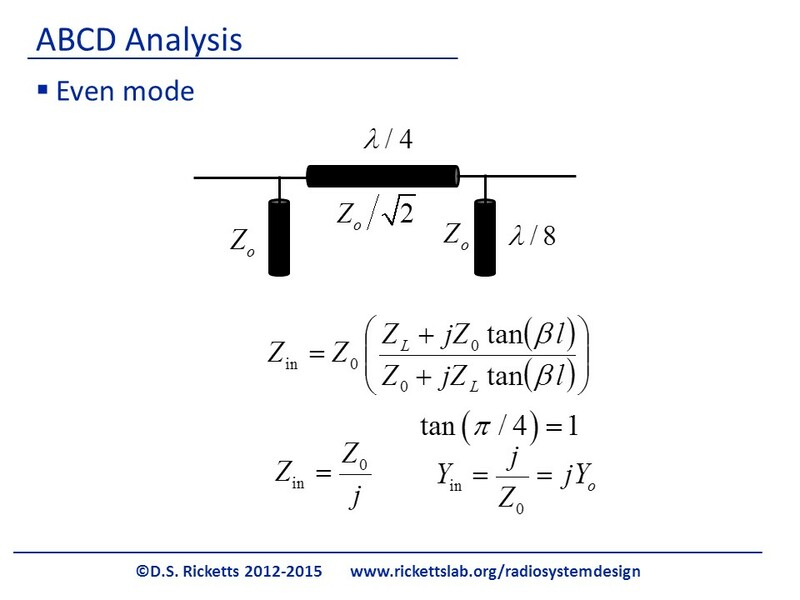 We can do the same analysis for the odd mode, here simply replacing ZL=∞ with ZL=0. Note that the only difference is the negation. Likewise, we can find the ABCD for the /4 transmission line from standard microwave textbooks. The cascade to ABCD can now easily be done, noting the difference between even and odd modes is just a negation. The ABCD once multiplied, can be converted to S parameters using equations from standard textbooks. The final S matrix is, where + is for even mode and – is for the odd mode. 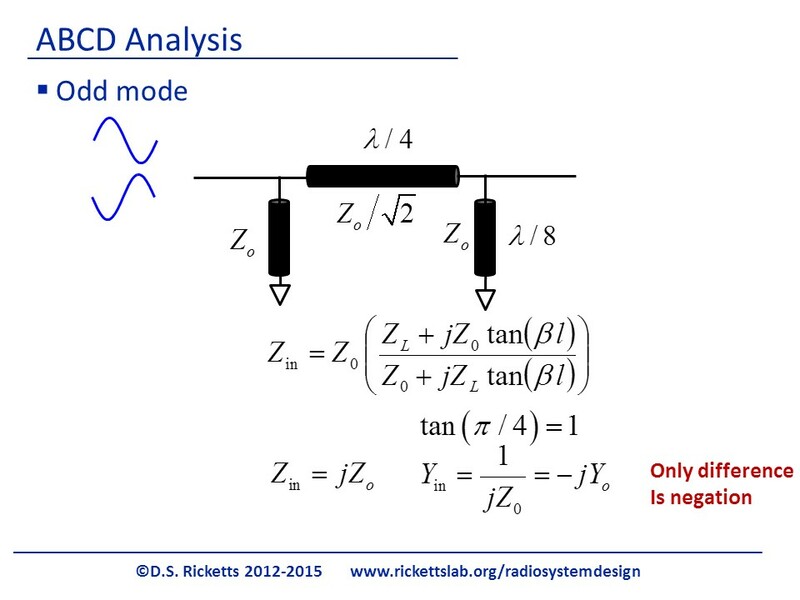 We find the S parameters for the system through the standard definition of incident and reflected waves. S11 is the ratio of the reflected wave to incident. We assume there is no incident waves on any other ports, i.e. a2= a3= a4=0. We decompose both into the even and odd modes. For S11 the input is componesed of two equal input, V+. The reflected wave has an even and odd component (also the same for this example), however we leave them in terms of even and odd so that we can utilize the S-matrix we found before. 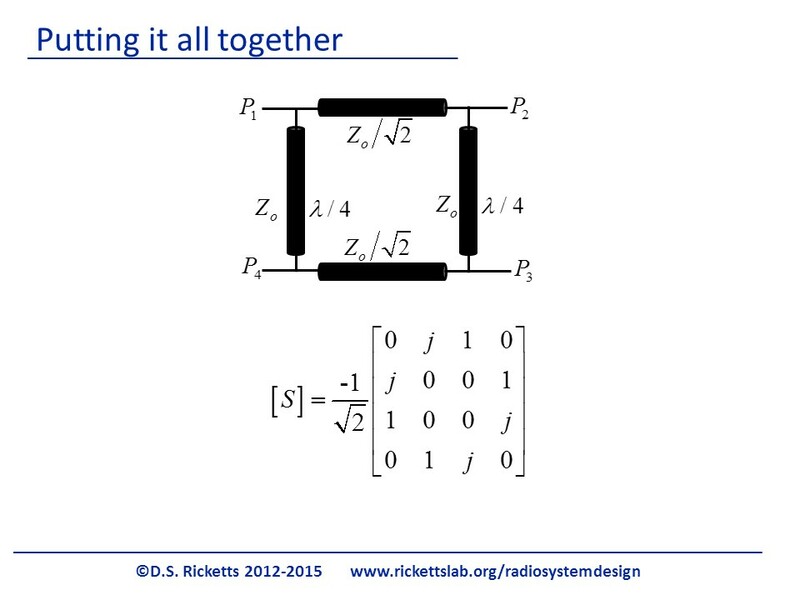 From our S-matrix for even and odd, we see that both ratios are zero. In addition, due to symmetry, we would find using the same analysis that all input ports are matched, i.e. S11= S22= S33= S44=0. We can now follow the same procedure for S21 and use the S-matrix as before. 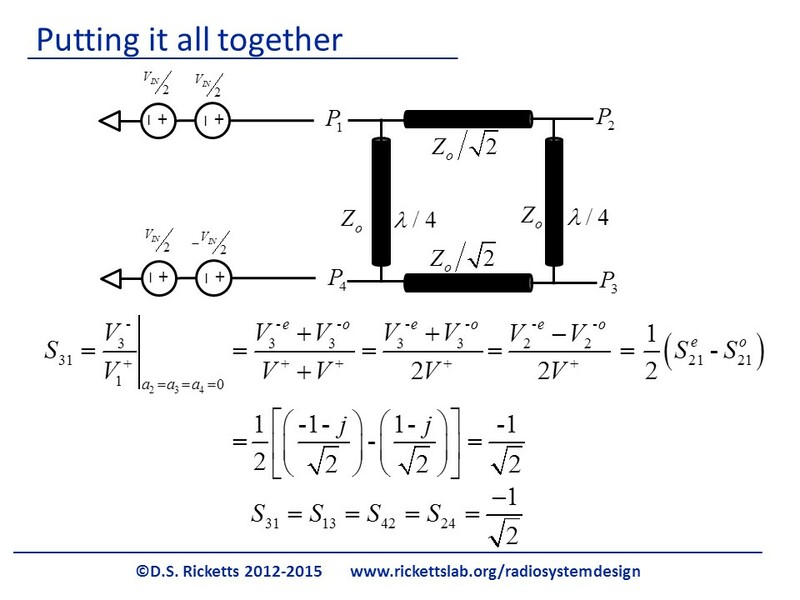 Due to symmetry, we also can solve for the corresponding S parameters for the other through signals. We see that the results is that half of the power (remember S31 is the voltage, so we square for the power) comes out of P3. In addition it is phase shifted by 90 degrees. For S31, we apply an even and odd mode input to P1 and measure the output at P3. Now we are going to do a trick here. 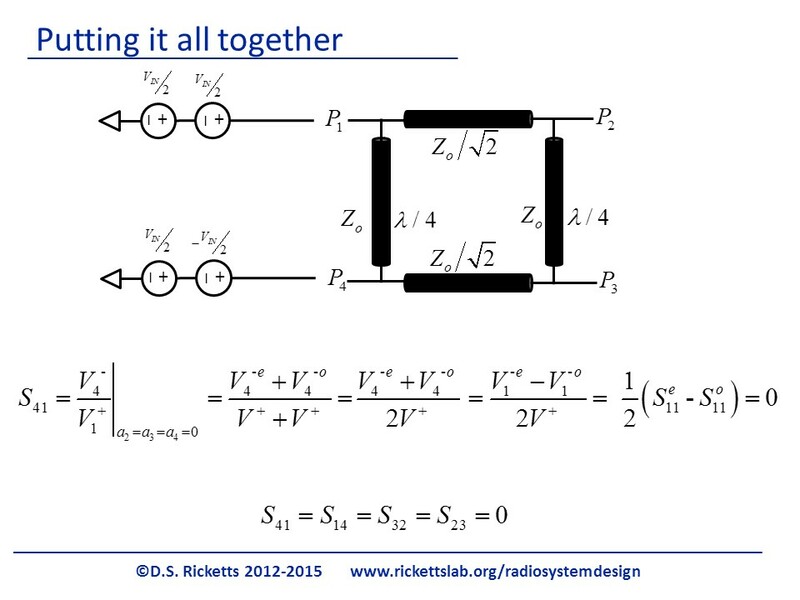 Having an even and odd mode at P1 is the same terminating P1 with 50 Ohms and having the same even mode at P4 and the opposite polarity odd mode at P4. This is useful, as we already know what the S21=S34 is. So we simply replace the even and odd mode with the even and (negative) odd mode, and use the solution we had found for S21 and S34. The only difference is the negative sign. Once again, we can use this to solve for the corresponding permutations of S parameters as before. We see that the results is that half of the power (remember S31 is the voltage, so we square for the power) comes out of P3. In addition it is phase shifted by 180 degrees. To solve for S41 we use the same trick of swapping the even/odd modes from P1 to P3 and reusing the solution from S11. As before, we can use the same procedure to solve for the permutations. We see that P4 is isolated from P1, a feature we leverage in our design. We want the input to split into two equal power signals. We do not want any power to be lost in P4. Here is our final result. The input at P1 is divided into two equal power signals at P3 and P2. The phase shifts are 180 and 90 degrees respectively, creating the desired 90 degree phase shift or quadrature output we will use for our radio.